Today's humpday blog look consist of basic colors. Black, beige and burgundy which work so well together because they are earth tone colors. I recently got this knitted sweater from Moddeals and it feels so soft I really love the feel. I was very happy with the weather when I shot this look hence my no layers. It actually felt so good to not wear a scarf and just a light faux leather jacket. Spring please hurry because I'm so tired of wearing too many layers! Enough ranting about the cold weather because I can go on forever lol. To offset the black and beige I wore my burgundy boots which I love because of the gold buckle on it. I remember contemplating on getting these a few months ago but I've made a lot of good use of them plus they were BOGO at Mandee so I just had to get them. #ShoeProblems. 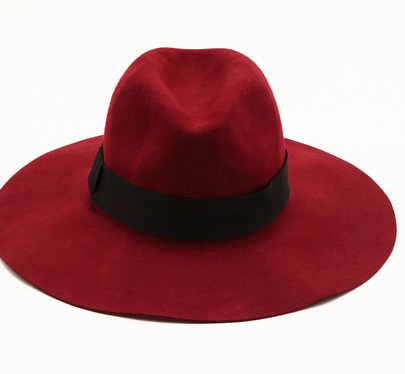 I also added this burgundy wide brim hat which added a little flare to the look which I loved. Hope you guys enjoyed today's post! As always thanks for stopping by.